The BNP has expelled Richard Barnbrook, its only representative on the London Assembly, from the party after he attempted to force a leadership challenge on Nick Griffin. Barnbrook resigned the whip in mid August in what was described as a protest against increasing tensions within the party, but remained a member - until the BNP threw him out this week. 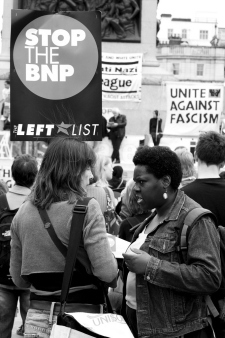 The BNP's heavy losses during the local elections have threatened to tear the party apart as they search for answers / someone to blame. It seems that Griffin's response has been to turn on his challengers in an old-fashioned Commie-style purge - and it's not ridiculous to wonder whether a complaint by Tess Culnane, former Barnbrook staffer and BNP candidate for Lewisham Mayor this year, accusing Barnbrook of bullying, is motivated by internal politics rather than / as well as genuine grievance. As an aside, the Barnet Eye blog also notes the BNP have been out collecting signatures on a petition to 'bring our boys home', but not making the association explicit. The party's website is pretty clear that all names and addresses will be added to their mailing database, so do be careful what you sign.